In a year when the biggest news in downscale dining was the Shake Shack IPO, and when every other start-up aims to be “the next Chipotle,” you might think the market for independent mom-and-pops was evaporating. 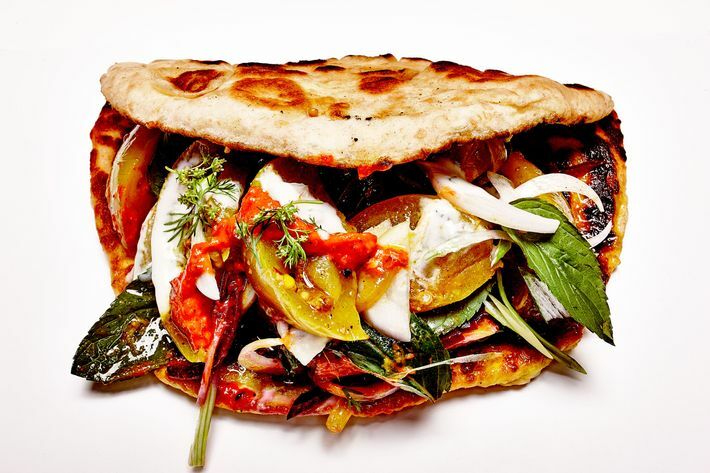 But you’d be wrong: This annual survey of the best new places to eat cheaply unearths one-of-a-kind destinations for hyperseasonal Anglo-Indian curry, home-style Vietnamese, new-school empanadas and old-school spinach pies, Japanese curry, and even French-bread pizza. Of course, if you want a burger, we’ve got that, too, in a Brooklyn neighborhood yet unscouted by Danny Meyer’s minions. Also on the sandwich front, fried chicken is having a moment, headlined by David Chang’s carefully plotted advance into Chick-fil-A territory with Fuku. But you can’t live by deep-fried thighs alone, which might explain the simultaneous rise of the grain bowl (even Fuku has one! ), a nutrient-delivery system that marks the intersection of musty macrobiotic convention and avocado-fanned West Coast cool. And that’s not all. We delve deep into regional Thai in Elmhurst, Queens, and demystify the esoteric Japanese snacks popping up around town. We navigate the city’s newest food courts to find the best things to eat on a budget, and hack menus that don’t seem so cheap on the surface but harbor hidden deals on unexpected culinary delights. Not, come to think of it, unlike New York itself. Rebecca Collerton will be the first to tell you she’s not cooking authentic Indian food at the thrice-weekly (Thursday through Saturday nights) pop-up that occupies Saltie, the Williamsburg sandwich shop she co-owns. She grew up in England, after all, not Mumbai, and is channeling cherished memories of Manchester’s Anglo-Indian curry houses. But because this is 2015 Brooklyn, and because Collerton’s a talented improvisational chef, her menu is as refreshingly seasonal as it is vibrantly seasoned. There might be green tomatoes in her paratha or curry vinaigrette and Cheddar in her salad, depending on the day, and pickles that will get your juices flowing in practically everything. Punk-rock drummer and former fine-dining pastry chef extraor­dinaire, total badass and wearer of paper soda-jerk hats — if you were looking for someone to give vegetarian fast food a spectacular high-low makeover, to make it cool, cravable, and also, you know, nutritious, you could do worse than Brooks Headley. Everything on his Superiority menu — veggie burger, faux Sloppy Joe, burnt-broccoli salad — is mysteriously satisfying and as good as you’ve heard, except the Hippy Wrap, which is better than you’ve heard. Nor do daily specials like vegan pump-cheese nachos disappoint. Have your vanilla-labne-gelato-and-straw­berry-sorbet twist while you wait for the savory stuff. (Yes, there’s a wait.) Then take your salubrious fast-food feast to a Tompkins Square Park bench, or, if one’s available, grab an old-fashioned swing-tray seat at the restaurant and imagine you’re dining at the late, great, decidedly non-vegetarian Prime Burger on 51st Street. It’s not that the drip, the cold brew, and the flat whites aren’t terrific, but why give the java top billing with all that sandwich magic happening out back in the kitchen? The basics — roast beef, chicken, bacon-egg-and-cheese — handily exceed expectations. The star of the show, though, is the open-faced Zappie, the Polish mom-and-pop owners’ take on a popular Warsaw street snack. It consists of sautéed onions and mushrooms spread onto a split baguette, smothered with Fontina, then oven-toasted until the cheese oozes, with DIY packets of Heinz on the side. 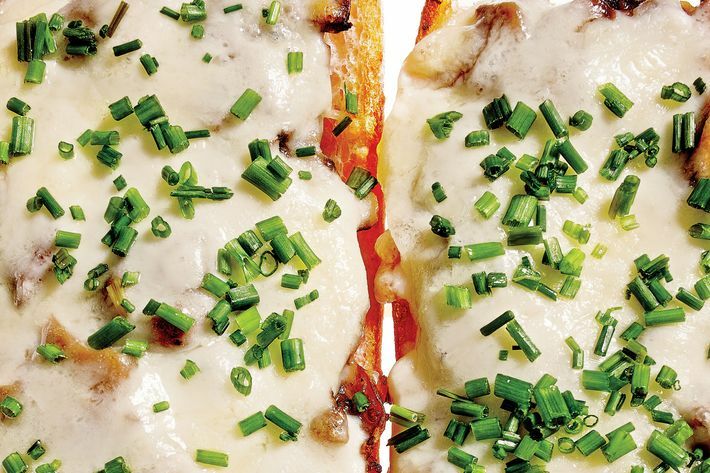 It’s what a Stouffer’s French Bread Pizza dreams of becoming. The No. 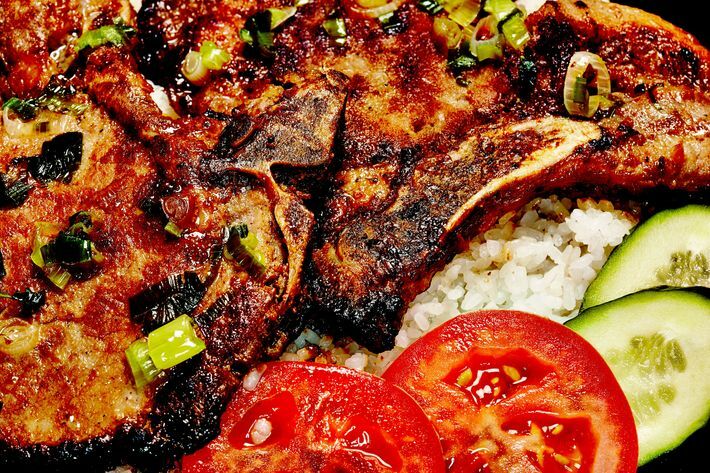 3 entrée, the $6.45 Vietnamese-style pork chop, is pounded thin, cooked through to a dull greige, served over broken rice, and (truth be told) kind of chewy. And yet, by some miracle of marination, you swear that this budget-friendly chop is among the most delicious you’ve ever tasted. For 50 cents more, you can get the No. 1 Chicken Lemongrass ($6.95), which is even better than the chop, at least according to host-server-owner Theresa Tran (whose sister Duc Tran helps run the kitchen). “That’s why it’s No. 1,” she says. Is that her idea of ­up-selling? Also worth the splurge: a fragrant phô and the occasional ­special rice-flour crêpes known as bánh xèo. Granted, Gravesend is a long way to go for modest, home-style Vietnamese cooking, but a sweeter little family-run storefront you won’t find in all the five boroughs. If you wonder why anyone would venture out for what is inarguably the easiest thing to cook at home, here is your answer: a recent fresh whole-wheat-spaghetti special at this new pasta parlor, dressed with pistachio pesto and chunks of summery zucchini. Of the nine other long-noodle options, we like the bucatini all’ ­amatriciana, a worthy version of that porky Roman classic. Italian-expat restaurants always seem to get wacky with the salads, and the Incident is no exception; one night’s thatch of arugula tossed with hunks of mango and avocado and dappled with black and white sesame seeds was an unexpected delight. And should you wish to supplement your carbs with more carbs, arancini are priced per piece ($3; two-ball minimum). 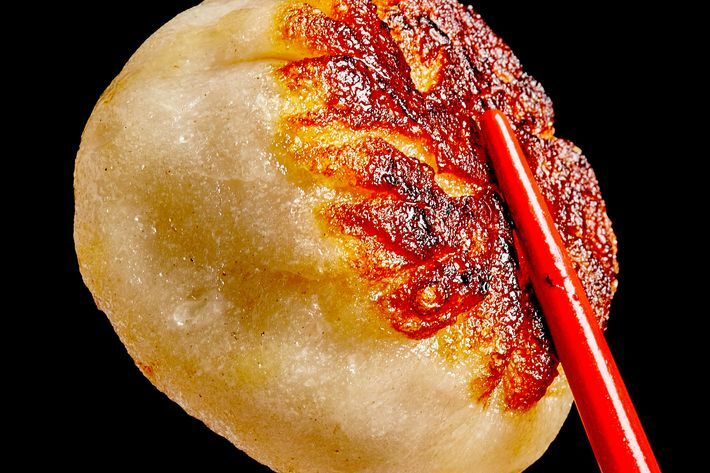 Of the many persuasive clues that East Wind isn’t your standard-issue dumpling shack, the dry-aged-beef potstickers rank highest. 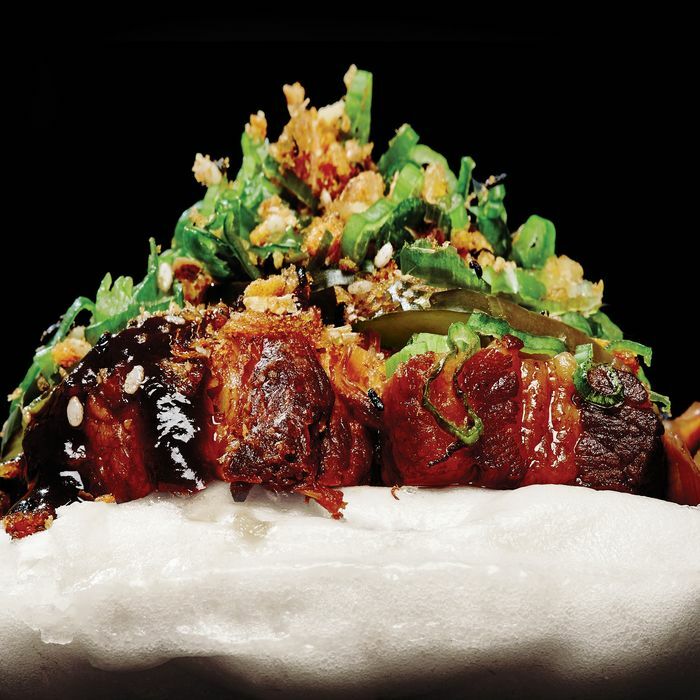 The innards are rich and funky, and the golden-seared wrapper housemade, like all the rest of chef Chris Cheung’s markedly fresh, springy, and steamy buns and baos, filled with everything from Niman Ranch pork belly (in the Gwaco) to a hidden dab of foie gras. With its counter stools and bubble teas, the snug storefront has a vintage luncheonette vibe and an entirely modern culinary sensibility. A good cup of joe and a decent BEC is all you ask of an unassuming place whose letters stand for coffee and breakfast. What you get: an escapee from Masa and before that Tavern on the Green brewing your excellent pour-over. And chef-owner Ali Sahin, who did fine-dining time uptown at health-obsessed Rouge Tomate, now repenting for those butterless, salt-free days by cooking what might be the East Village’s best breakfast sandwiches. You want the juicy housemade chorizo patty with scrambled eggs on a squishy brioche roll. Unless, that is, you’re craving the juicy housemade merguez sausage with Cheddar and egg on a supersize croissant. 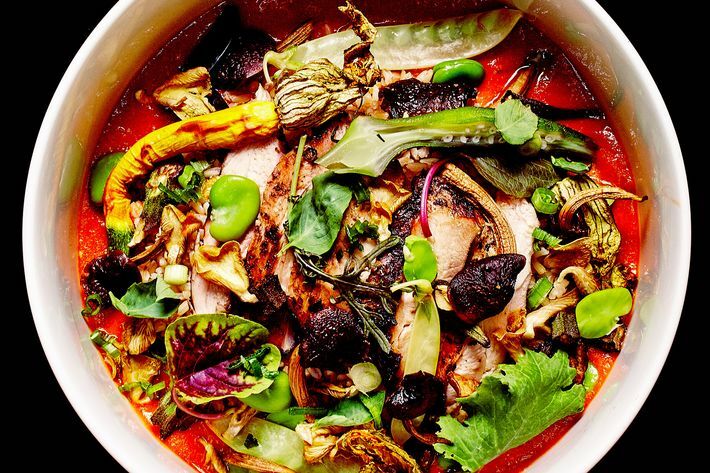 For carbophobes, there are big bowls filled with all sorts of delicious combinations like heirloom beans and pork belly or pulled chicken and pastured eggs. There’s no shortage of coffee bars that serve food in New York. C&B is the one you wish you had on your block. It’s not that Taste of Northern China is as hard to find as everyone says it is. It’s that after you’ve found it, you wish perhaps you hadn’t. When food bloggers describe the place as a hole in the wall, holes in the wall consider libel suits. To get in the door when there’s another customer inside you have to do that thing you do to get out of your car when you’ve parked too close to somebody’s Nissan Armada. And the phrase “looks clean enough to eat off the floor” did not originate here. In short, it’s a dump, but a dump with soul and some cheap and wonderful food. Get the thick and chewy “cold skin” wheat noodles mingled with bits of wheat gluten in a vinegary sauce; a Chinese chopped-pork “burger”; and some skewers from a list of 34 — we recommend the lamb, the cauliflower, the hot dog, and especially the rice cakes. They’re all aggressively seasoned with cumin and chile powder and cooked over hardwood charcoal the way they do it on the street in Flushing. You can’t open a single-item comfort-food specialty shop these days without a sense of humor and a willingness to cater to the Tic Tac Mixers generation in the flavor department. Thus Baba’s, named after the owner’s pierogi-master grandmother, stuffs its dumplings with everything from a mixture of jalapeño, potato, and Cheddar to mac ’n’ cheese — a soporific combo that picks up where the ziti-topped pizza left off. In spite of these efforts, the best pierogi on the menu is a classic — a surprisingly unstodgy boiled variety filled with a piquant sauerkraut and tossed in butter and chives ($8; get them topped with sautéed mushrooms for 75 cents extra). We imagine Baba would back us up on this. 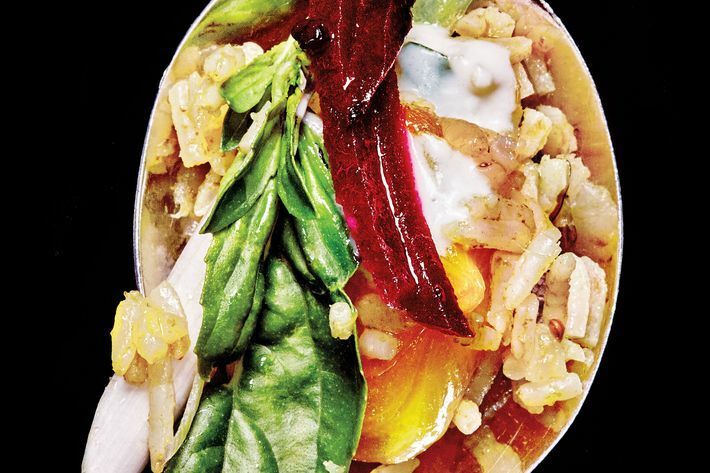 Chef-owner Rawlston Williams might not like the comparison, but there is a suggestion of Chipotle in his “island bowl,” a customizable array of starch, sauce, and protein. And yet it’s doubtful that Steve Ells has ever envisioned a combination like panko-dusted lamb shank with coconut-ginger sauce and chickpeas and rice. And in a neighborhood lousy with roti, Williams’s are flaky and tender, perfect for scooping up morsels of curry goat mingled with chickpeas and sweet potato. Three restaurant-industry veterans have opened an Argentine empanaderia in the shadow of the Williamsburg Bridge: a chef who worked at La Grenouille and La Silhouette; the former GM of Salumeria Rosi; and her husband, who ran a joint in Buenos Aires long enough to develop a taste for these baked stuffed pastries. Each empanada has its own repulgue, or pastry-fold pattern, so they’re easy to ID. Of the various old- and new-school styles, we’re partial to the soup-in-hand-pie-form French Onion Fugazetta, the red-wine-braised Beef Burgundy, and the Chicken Curry. For dessert, try the sweet-tart Guava Cheesecake version with Toby’s Estate cold-brewed coffee on tap. The East Village pintxos bar’s new Basque-hot-dog takeout window might not be the Coney Island boardwalk, but isn’t this more or less how Shake Shack got its start? 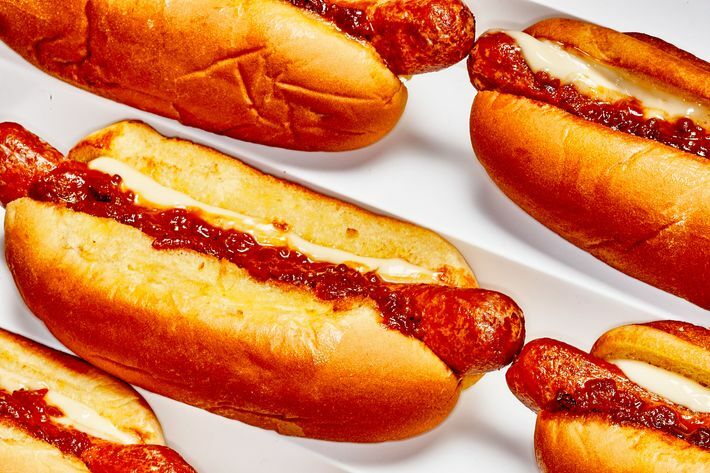 The dogs are made from the restaurant’s own pimentón-spiked chistorra sausage — thinner and smoother than chorizo but just as rich and garlicky. They’re also dressed with aïoli and a housemade piquillo-pepper mostarda that might be the best thing to land on a frankfurter since French’s. And, in keeping with age-old Basque tradition, the kitchen serves them on Martin’s potato buns. To wash down the dogs: horchata slushies made from chufa (tiger nuts) instead of rice. Saturdays and Sundays only. If your knowledge of phyllo dough begins and ends with spanakopita, Pi Bakerie will expand your horizons. In fact, the sleek café seems determined to spread the Greek-food gospel, from frosting-thick yogurt to oozy moussaka. But the main attraction is the rotating selection of savory pies, stuffed with ingredients like leeks and kale or spiced lamb and best sampled in a lunch combo with a spoonful of Greek salad and a stuffed grape leaf. Pi is an offshoot of Astoria’s illustrious Artopolis, a confectionery pedigree visible in the drawers and cake stands stocked with sticky baklava, deep-fried diples, and grape-must-flavored rings. A type of griddled roti that’s chopped into almost spaetzlelike pieces and stir-fried with eggs and spices, meat or seafood curry, and vegetables. Think fried rice without the rice and also about 100 times hotter, the super-absorbent flatbread soaking up all the incendiary flavor enhancers like a high-octane sponge. That’s the Sri Lankan street-food specialty called kottu, and this is its lively, three-table, six-barstool Lower East Side house of pain. Each of the seven kottu varieties on offer, from Deviled Beef to Tofu Blast, is addictively spicy and unquestionably not safe for baby palates. By now, it’s pretty generally agreed that there is no limit to what single-item-menu foodstuff a would-be fast-casual tycoon can attempt to build a restaurant concept around. Still, some choices are better than others, and this is a great one. A recent Douglas Rodriguez celeb-chef sighting in the back patio should come as no surprise: LoLo’s chef-partner Raymond Mohan is a veteran of Rodriguez’s Patria and Chicama. The Shack is a much more casual affair, a colorful, kitschy ode to Caribbean beach vacations, and the kind of food that fuels a hot night in the tropics. The signature dish isn’t a dish at all but a knotted plastic bag swollen with your choice of shellfish and sauce. The shell-on shrimp are fresh and succulent, but anything swimming in Mohan’s coconut curry would probably taste great. These “steampots” come with plastic gloves and a bib that reads “Time to Get Cracking.” Isn’t it always? If the last time you were enjoying a taco, you thought, If only this tortilla were thicker, flakier, and much more buttery, then Goa Taco is the place for you. Chef-owner Duvaldi Marneweck’s contribution to the field: an Indian paratha griddled crisp, then folded around various multi-culti fillings. In classic fusion-food-mash-up form, Goa debuted at Smorgasburg last summer and expanded to a cozily ramshackle pop-up on the Lower East Side, where Marneweck continues to extend his residency. On the strength of sensations like the paneer cheese with spinach pesto, fried chickpeas, and pickled tomatillos, we hope he remains permanently popped. Claims of ecosuperiority can make this nascent franchise — or “zero-emission Neapolitan pizzeria,” as corporate propaganda has it — seem like an ad for backer T. Boone Pickens, whose natural-gas empire powers its fleet of food trucks. But it’s hard to quibble with the quality of the individual-size pies, each cooked in under 90 seconds in (here we go again!) “the only open-mouth electric oven built in Italy.” Forcella founder Giulio Adriani has trained the crew to carefully stretch the dough, apply the San Marzano tomatoes and fresh mozzarella, and achieve a crisp and airy crust. Go for the A Diavolo, dotted with jalapeños and soppressata and drizzled with Mike’s Hot Honey. Not, as it might first appear, yet another Village slice shop: This one’s dedicated to the Lebanese flatbread typically eaten at breakfast. Thankfully, there is no time-of-day stricture imposed on the crisp, chewy versions baked here, which come minimally topped with za’atar, mild cheese, thick labne, ground beef, or vegetables and herbs. (You can even get it delivered, but pepperoni’s not an option.) Note also the daily dessert specials, their honeyed, nutty sweetness cut by the house unfiltered Turkish coffee. Is New York a taco town yet? 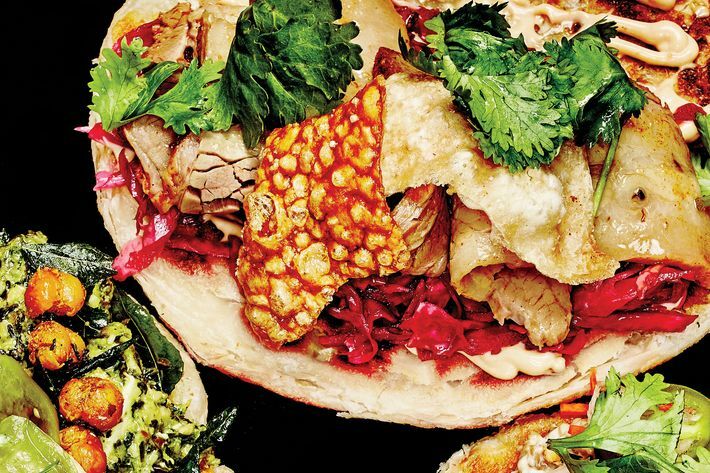 Have we achieved even a modicum of taco greatness? In spite of what the entire populace of Los Angeles would say, the answer is “yes,” with the latest evidence on display at Alex Stupak’s combination tequila bar and tortilleria. What started off a little tentative has evolved into a taco tour de force. The housemade tortillas have gone from slightly flimsy to wonderfully supple. The headliner taco al pastor is an exemplary study in flavor and texture: crisp and fatty bits of pork neatly juxtaposed with sweet, cooling slivers of pineapple and three piquant salsas. Equally delicious are potato-and-chorizo tacos, beef tacos, and all the side dishes — especially black beans with pork scraps, and white beans flavored with the earthy Mayan spice blend black recado. We’re a bean town now, too. In a city enamored with Thai and Indian curries, the Japanese variety gets precious little love. The good folks at this sister establishment of soba specialist Cocoron next door aim to right this wrong with a menu devoted to Sapporo-style yakusen soup curry, infused almost medicinally with “detoxifying” herbs, and the thicker, velvety-­textured roux-style curry with rice. Both are complexly flavored and deceptively filling, especially if you go crazy with add-ons like skewered chicken katsu and poached eggs. And watch for specials like Okinawa taco rice, a Tex-Mex vestige of ’60s-era American servicemen stationed overseas and craving a taste of home. The namesake dish is a glorious mound of melted cheese scraped off the wheel and onto a platter of potatoes, cured meat, and hunk of baguette, and it will gird you against any brisk winter winds gusting off the East River. Even in clement weather, the kitchen does right by elegant and eclectic open- and close-faced sandwiches, be they constructed of briny sardines and ribbons of fennel; pinwheels of prosciutto with figs and hazelnuts; or even a buttery ooze of fromage blanc, dark chocolate, and strawberry-tarragon jam. The actual “arepa lady,” Maria Piedad Cano, continues to ply her street-cart trade a few blocks away, but her sons (the arepa gentlemen?) have anchored the family tradition by giving her ephemeral creations a permanent home. After a recent renovation, the snug space accommodates (slightly) larger groups, all drawn by the allure of Colombian corn cakes, plus amenities like plates and tropical juices. The sweet, pillowy arepa de queso (lush with melted mozzarella) and the intensely corny arepa de choclo are crowd-pleasers, but don’t underestimate the arepa rellena: Stiffer and less sweet, it’s a sturdy vehicle for fillings like chicharrón and chorizo. A permanently parked burger truck in a southeastern Brooklyn strip-mall parking lot that’s worth the trip? It’s next to an inlet that isn’t quite the Maine seacoast but still feels as scenic and outdoorsy as it gets within spitting distance of the Belt Parkway. There’s even a picnic table. Why you really should go? Because Andrew Zurica’s four-ounce smash burgers are hard-seared, crisp-edged, and incredibly cohesive. And while they seem super-simple, each detail and every ingredient has been as carefully considered as a DB Burger. Chief among these ingredients is grease — the secret weapon of a worn-in flattop that imparts to each new raw patty the deep, delectable flavor of burgers past. Terrific deep-fried bacon-wrapped chili dogs, too. This long, narrow establishment is all kitchen, save for the small vestibule where you place your order. But the Lebanese spreads, salads, sandwiches, and stews that emerge from that space belie the makeshift fast-food setup. Beyond the familiar falafel and hummus, you’ll find relative rarities, like sandwiches stuffed with veal tongue, liver and onions, and mashed spiced cod. Best of all might be the betenjan mashwi, a streamlined, minimalist construction of marinated eggplant rolled up in thin, chewy flatbread and charred on the grill. Sure, the novelty of the semi-secret location at the end of a formerly closed-off office-building lobby is part of the appeal. And so is the nifty renovation of what used to be glass-enclosed ad-display alcoves into mahogany-paneled seating cubbies with drop-down tables. But none of that trumps Roger Gural’s flaky croissants, pear-vanilla baguettes, and whiskey-pecan babka. The lunchtime-only pizza made from baguette dough is pretty amazing, too. And bonus points for a stubborn, old-fashioned determination to keep production low and turnover high, which is why you won’t find Gural’s handiwork at your local coffee bar, and why everything’s always exceedingly fresh. The stuffed Salvadoran masa pucks called pupusas can be found in Latino enclaves throughout the boroughs, but made their move into mainstream foodie culture via Red Hook Ball Fields vendor Solber Pupusas. Now lower Manhattan has its own dedicated pupuseria, a tiny shop where toothpick flags inserted into the corn cakes indicate their fillings, which include, among other things, chicken; beef; the Central American flower bud named loroco; and revueltas, a traditional mix of mozzarella, refried beans, and chicharrones. Your pupusa arrives piping hot and way too sturdy to submit to plastic cutlery, so do as the pros do — top it with salsa and the fermented-cabbage salad curtido, and use your hands. This takeout sandwich shop, the love child of the owners’ Morris grilled-cheese truck and the original sandwich-focused incarnation of their Crown Heights restaurant Glady’s, isn’t shy about touting its suppliers — Landaff Creamery, Brooklyn Cured, Orwasher’s Bakery, and Queens County Farm among them. Still, a sandwich is only as good as the sum of its parts, and the kitchen designs and constructs as well as it sources. The Pollos Hermanos is chicken salad Buffalo’d with Point Reyes blue, slices of celery, and hot-sauce mayo. The gently pressed European Combo is like an outsize Italian hero crossed with a cucumber sandwich: It delivers the salty cured-meat wallop of the former while maintaining the pinky-raising neatness of the latter. And the classic grilled cheese is as delicious served under a brick-and-mortar roof as it is from the side of a truck. The sign outside is written in Chinese, but the guy at the door greets you with three words: “Traditional Greek cooking.” This, you learn, is Kiki’s. Kiki is from Poughkeepsie, but her father is Greek. She used to tend bar down the block at Forgtmenot (no “e” after the “g”). Now she and some of Forgtmenot’s Greek-American crew run Kiki’s together. 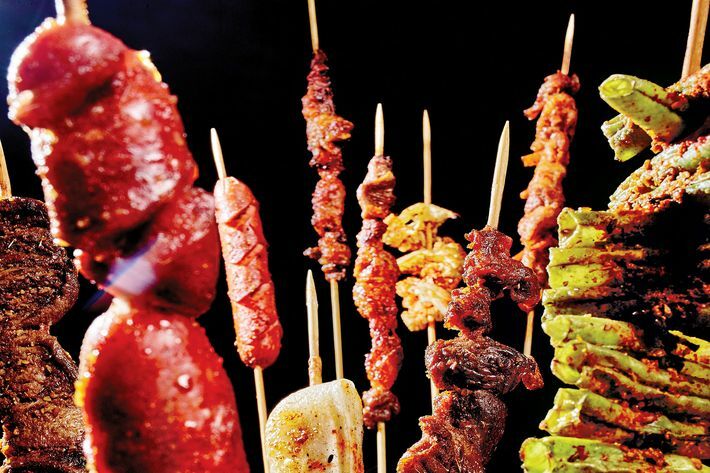 The menu, in ­English, not Chinese, settles any lingering doubts. So does the cooking, a lot of it done by Rita, a.k.a. Auntie, a family friend of one of the partners. Nothing much you haven’t tasted before: tzatziki, saganaki, zucchini chips, grilled octopus, fries with oregano and feta, whole fish, moussaka, pastitsio, and a “traditional-no-lettuce” Greek salad. Then why can’t you stop eating it all and ordering more? Maybe it’s the thrill of discovering Greek-grandma cooking in a neighborhood where you don’t expect to find it. Maybe it’s the vibe — more hipster watering hole than Greek Astoria estiatorio. Probably it’s because the food is so simple and delicious. 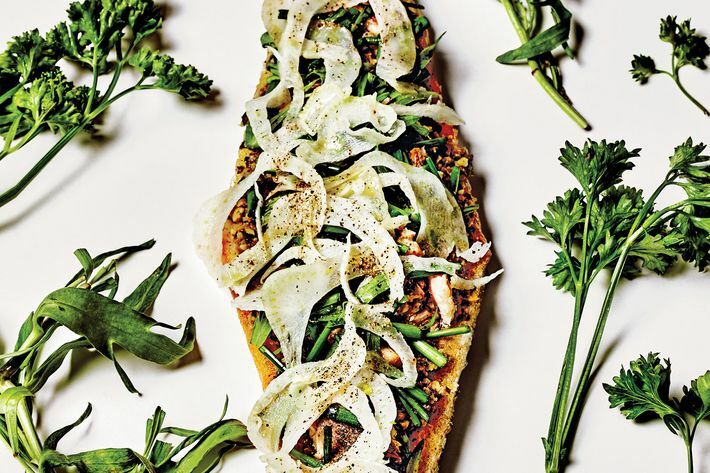 “People really want cheap food,” says Francine Stephens, co-owner with her husband, chef Andrew Feinberg, of this downscaled incarnation of the space that once was Marco’s, and before that, the original Franny’s. It’s a logical conclusion to draw — especially in the shadow of Barclays Center with its game-night hordes, and new neighbors like Shake Shack and Doughnut Plant appealing to our baser instincts. So now, where there were Coravin-pierced prestige wines and wood-grilled lamb chops, there are cans of Bud, $8.50 cocktails, and snacky, unpretentious bar food, including a burger and fries. But old habits die hard. There may be no written attribution of sourcing and pedigree — there isn’t even a printed menu — but said burger is made from grass-fed beef and perfumed with smoke from the wood grill, and the sharp and funky cheese on the excellent ham and cheese toast comes from the couple’s gourmet grocery, Bklyn Larder, down the street. The ham, by the way, is housemade, and absolutely killer. Georgians, as we’ve noted in these pages before, are as chauvinistic about their ancient cuisine as any Italian or French gastronome, and this Greenwich Village restaurant, named for the country’s largest city, offers evidence to support the bias. If it’s your first time, you want the imeruli salad (like a feta-less Greek but with a wonderfully creamy-tangy walnut-purée dressing). You want the khinkali (a plate of overgrown soup dumplings neatly pleated like old-fashioned ice packs and filled with meat and broth). And you want the adjaruli khachapuri (essentially a baked-to-order bread canoe, its hull overflowing with melted, mildly sour sulguni cheese and a raw egg yolk for stirring in). Then you want a 48-hour nap. *An earlier version of this article incorrectly referred to Little Saigon Pearl as Little Pearl Saigon.